Natural green Superfood energy for a stronger, healthier immune system in a great tasting powder. Greens Plus Organic Superfood Wild Berry is a certified Organic blend of raw Green Vegetables, Superfruits, Sea Vegetables, and Probiotic cultures. Greens Plus Organic Superfood Wild Berry is a certified organic blend of raw green foods, superfruits, sea vegetables, and probiotic cultures. Greens Plus Organic Superfood Wild Berry is purely vegan, and always soy, gluten, & dairy-free. 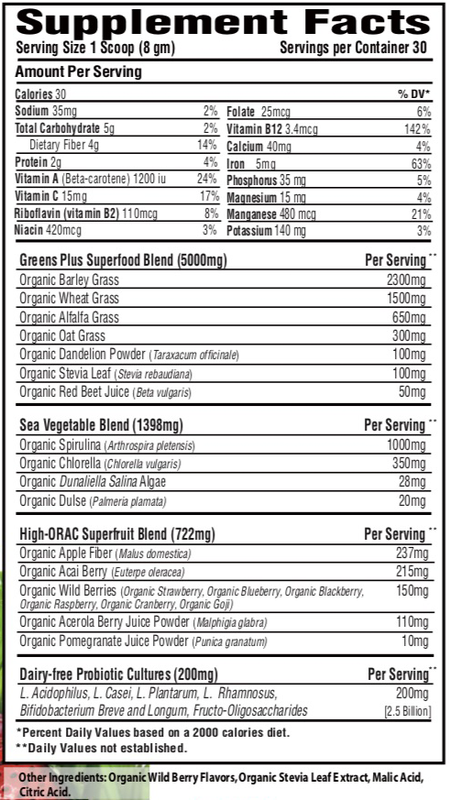 All Greens Plus Organic Superfood powders are Non-GMO and USDA Organic. GreensPlus products offer a high ORAC value. Oxygen Radical Absorbance Capacity (ORAC) is the standard testing method used to measure antioxidant-rich foods. Higher numbers have a greater capacity to neutralize free radicals. Other ingredients: Organic Wild Berry Flavors, Organic Stevia leaf Extract, Malic Acid, Citric Acid.